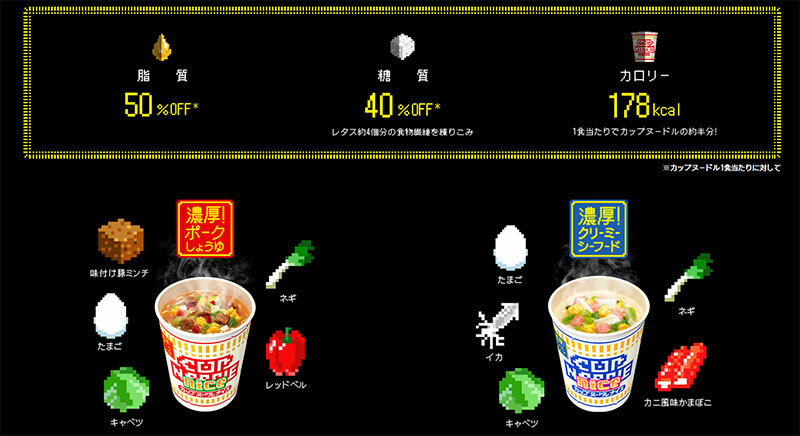 A new range of instant cup noodles called Cup Noodle Nice has been introduced in Japan by food manufacturer Nissin. The new Nice range is marketed as an “impossible combination” of a thicker soup that is also ‘better for you’: it offers a stronger taste andt hicker soup than the original Cup Noodle products yet contain fewer calories (178kcal), 50% less fat and 40% fewer saccharides, according to Nission, delivering “a completely new type of instant noodles”. The “newly developed” noodles are also said to be non-fried and formulated with fibre equivalent to four lettuces. The two varieties available – Noko! Pork Shoyu (Rich! Pork Soy Sauce), sold in a 58g size, and Noko! Creamy Seafood (Rich! Creamy Seafood), in a 57g size – both carry an RRP of ¥180 ($1.60) and offer a “guilt free” noodle experience. Both are available from 10th April 2017.